Tree Root Basics and Deep Root Feeding – Biofeed Solutions, Inc.
Root systems consist of larger perennial roots and smaller, short-lived, feeder roots. The small feeder roots constitute the major portion of the root system’s surface area. Feeder roots grow out from large woody roots and usually grow up toward the soil surface. At the surface, feeder roots mix with lawn and shrub roots and compete for the water, oxygen and nutrients that are more abundant near the surface. Trees and plants growing in urban areas seldom develop taproots, which significantly decreases longevity and overall tree health. 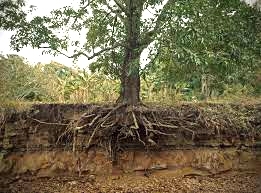 Root Basics: Soil Biological health has a dynamic effect on tree growth above and below ground. The root system of a tree performs many vital functions. Roots store food needed to produce spring foliage- they absorb and transport water and minerals from the soil- and roots anchor the tree to the ground –Just for starters! However, it is important to consider that he condition and quality of the SOIL and the living rhizosphere will determine the longevity and overall health of the trees and shrubs in any landscape setting. The major function of feeder roots is the absorption of water and minerals. Feeder roots are usually located throughout the entire area under the canopy of a tree. Under healthy soil conditions as much as 50 percent of the root system grows beyond the drip line and may extend as far as the height of the tree. Amazing stuff! Soil research combined with old-school fundamentals indicates that the emphasis should be placed more on feeding and conditioning the soil and increasing the oxygen levels below ground, thereby enhancing the growing conditions for the proliferation of beneficial AEROBIC soil organisms. In addition, it is important to supply nutrients in an organic or organically buffered solution to protect aerobic soil life from potential toxicity. As in any feeding or fertilizing program, ignoring the needs of soil organisms such as earthworms or microbes will result in poor biological soil health. This will inevitably have a negative affect the health of the trees and plants living in such soil. A growing number of tree and landscape professionals today realize the need for natural soil care and its long term benefits. One common method of feeding established trees and plants is “Deep-Root Feeding” or “Injection Feeding.” This is usually done using a pressurized deep-root probe or injection device that places a solution of select nutrients and sometimes liquefied organic additives into the root zone where hungry roots can take them into the entire plant system. Biofeed® ARBOR-PLUS™ is a fertilizer & soil management product which provides ingredients in a highly concentrated liquid formula that will create a more balanced and natural soil environment to help you grow healthier trees and shrubs! Apply Biofeed® Arbor-Plus™ today and see healthier, vital trees! ARBOR-PLUS™ provides a balanced organic blend of primary and micronutrients plus plant derived amino acids in a liquid concentrate. These promote quicker healing, deep root growth and strong vertical and horizontal growth of trees & shrubs. ARBOR-PLUS™ Promotes more balanced biological growth by enzymatically releasing oxygen to support the growth of Aerobic microbes living below ground. Its trace nutrients are organically chelated for rapid uptake to promote deep green leaf color while it supplies essential nutrients commonly lost due to leaching. Helps to reduce disease conditions! ARBOR-PLUS™ is an easy-to-use and cost-effective concentrated liquid that should be diluted in water for quick and easy application as a professional Deep Root Feed (DRF) solution or foliar spray application. Promotes balanced leaf, stem and root growth of all types of trees & shrubs and may be applied year-round!